Who Are Sherpas & Their Roles In Himalayas? Sherpa people are an ethnic group of people dwelling in the Everest stretch and Himalayan legends or the legends of Tall. Sherpas of Nepal live in the Solu-Khumbu district in the hinterland of the Himalayas, the oldest community of which, settled themselves in the Pangboche village. This area consists of Khumbuat 12,000 to 14,000 feet, and Solu at an elevation of 8,000 to 10,000 feet. According to Sherpa beliefs, the tribe emigrated to Nepal from the Kham region of eastern Tibet. 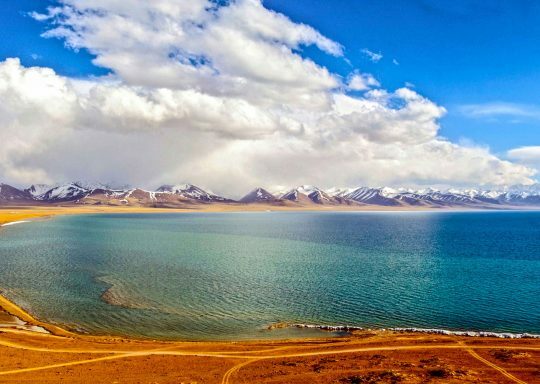 Historians, however, advocate that they were nomadic herders who were driven out of their original homeland in eastern Tibet by the warlike populace during the 12th and 15th centuries. They wandered to the locale around Tingri but skirmishes with the local inhabitants caused them to relocate to new pastures. They crossed the Himalayas and settled peacefully in their present homeland in northeastern Nepal. It is deemed that these ethnic people traveled to the Solu – Khumbu region from Tibet over 1000 years ago in the 15th century. During those times, they made their living as traders, herders and farmers. Sherpas are majorly Buddhists and they believe that the mountains are the homes of enlightened deities. Belonging to the ancient Nyingma, or Red Hat, sect of Tibetan Buddhism, their practice is a mixture of Buddhism and animism. Sherpa people are the indispensable men of the mountains, but their involvement and contribution have largely been disregarded. There’s even confusion about what the word ‘Sherpa’ means. 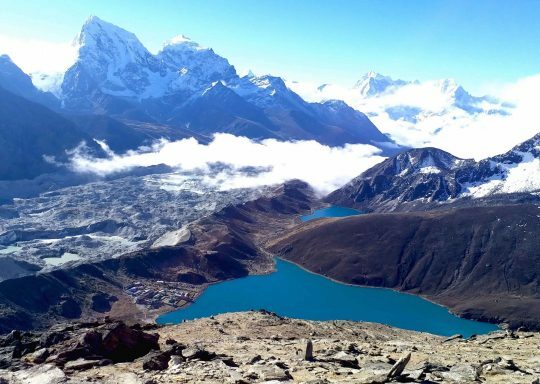 A misconception regarding the Sherpas and porters being related to the same community needs to be well understood. Literally, Sherpa means ‘people from the East’ and not someone who carries your luggage for you during your expedition. Sherpas living in the Everest region of Solu-Khumbu can be porters or a Nepali living somewhere else in the same or different region of the Himalayas can be porters too. Porters are not communities but they are terms used for people from any community who do your work, like carrying your luggage or other goods up and down the rugged valleys during your trip. Some of them speak fluent English due to their years’ experience, but most only understand the language, so communicating could be quite poignant. In the Himalayas, every male is a porter at one time in their life. Porters who learn English in the consistent company of the foreigners eventually start working in the tourism sector as guides or team manager. Some people venerate Sherpas as pure, natural and mystical gods of the nature. But the truth is Sherpas are just like the rest of us, some good, some bad, and some in between good and bad. Sherpas are usually happy and easy going people. They are proud about their mountain heritage just like the Gurkhas, who are proud of their warrior dexterity. Although, in the recent years, they have adapted the mountaineering way of life, they keep hold of their respect for the mountains. They have made an effort to prevent the foreign climbers from engaging in disrespectful and polluting activities, which they fear will infuriate the gods. Let us now get a bit personal with the Sherpas. The language of the Sherpas, called Sherpa or Sherpali is a dialect of Tibetan. They use the Tibetan script for writing and Nepali when dealing with other people. 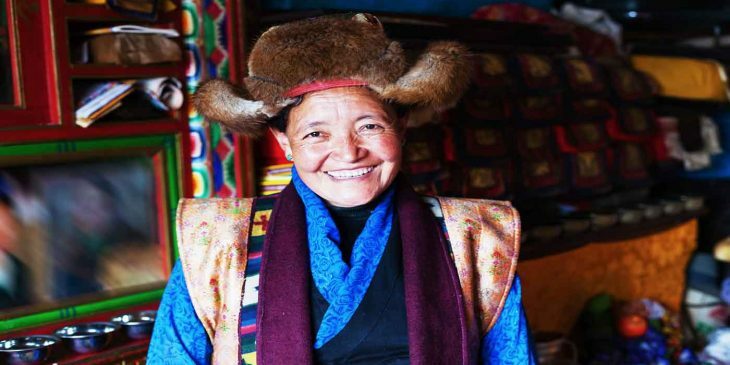 An important aspect of Sherpa religion is the monastery (gumpa). 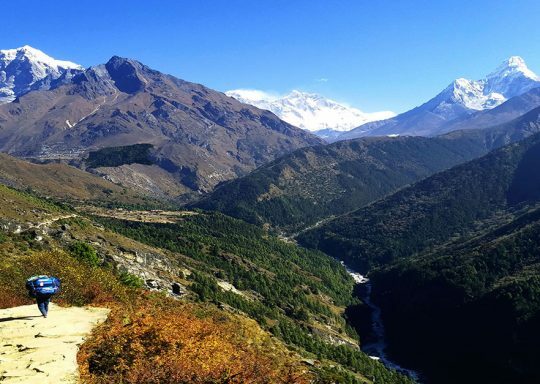 There are over two dozen monasteries dispersed throughout Solu-Khumbu region. The Sherpa diet is dominated by starchy foods supplemented by vegetables, spices, and occasionally meat. They drink tea served with salt and butter. Dairy products, especially butter, cheese and curds are important in the Sherpa diet. Practicing Buddhism, they do not kill animals, but they do eat meat. ‘Chhang’ is a favorite beverage of the Sherpas. It is made from maize, millet or other grains. Chhang has considerable symbolic and ritual significance and it is consumed at meals and, social and festive occasions. Sherpa people raise maize, barley, buckwheat and vegetables. Potato is the mainstay of their diet. Khumbu Sherpas raise cattle and yak, which provides wool and milk byproducts, butter and cheese. Trade between Nepal and Tibet is of considerable historical importance in the region. Salt, sheep’s wool, meat and yak are still brought from Tibet into Nepal in exchange for food grains, rice, butter and other manufactured goods. The Sherpa’s reputation as excellent porters and guides on mountain-climbing and trekking expeditions has brought them a new source of income and for some Sherpas, a comfortable living. Figuratively and literally, Sherpa kids are named after the day in which they are born: Sundays (Nima), Mondays (Dawa), Tuesdays (Mingma), Wednesdays (Lhakpa), Thursdays (Phurba), Fridays (Pasang) and Saturdays (Pemba). Interestingly, naming kids after the days of the week leads to too many Pemba Sherpas, Mingma Sherpas and Lhakpa Sherpas. • are highly regarded as influential mountaineers and experts in their local area. • are renowned for their hardiness, expertise, and experience at very high altitudes and are the backbone of any expedition. • can enrich your travel and climbing experience in many ways and ensure safety. • introduce you to the local culture and the locals, local geography, local flora and fauna, and explain the meaning of customs and festivals. • have excellent practical experience in climbing techniques and providing trekking, base camp and high camp logistics. • are people with a proven track record of honesty and personal integrity and are committed to climbing practices that do not cause adverse environmental impact. • have a phenomenal energy and power on the mountain, when it comes to climbing mountains. • have thorough experience and techniques with fixed rope climbing, use of any type of mountaineering gear, use of oxygen, high altitude food, avalanche and high mountain rescue techniques. Some of the prominent Sherpa names that sparkled Nepal to global fame are Tenzing Norgay Sherpa, Ang Tharkay Sherpa, Babu Chhiri Sherpa, Apa Sherpa, Pasang Lhamu Sherpa and many more. The immigration of the ethnic Sherpas from Tibet, to the Nepal Himalayas proved to be a blessing for them as well as for Nepal. Helping the enthusiastic climbers from all over the world, in their successful journey is what Sherpas are best at. Guiding past rugged trails, sharing the nuance of logistic burden or refreshing with joyful recalls at difficult times, the friendly Sherpas have been relied on for triumphing over the gargantuan Himalayas. Remember, the Sherpas are just not your servants. Use them for important tasks even if they speak poor English and are not well educated. They need respect, and they deserve it! 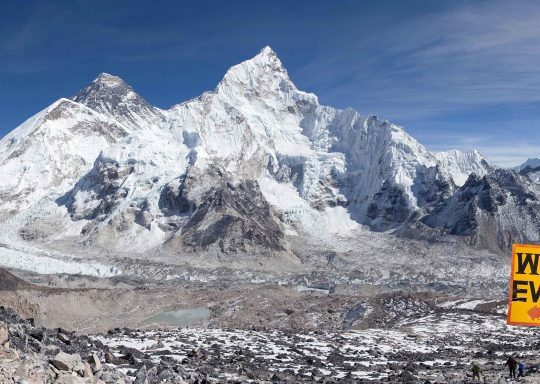 Without Sherpas, most climbers would not be able to get up the mountains!